It’s December 21, and no doubt, many of us still have some shopping to do. Are you looking for some stocking stuffers? Or maybe you’re just searching for a few more items to round out the gift giving to a loved one, friend or business associate. Here are some thoughts from the (dog) staffers of THE NEW BARKER for the dog-loving human on your shopping list. TOY STORY: To Infinity And Beyond. There is an endless array of toys for dogs. 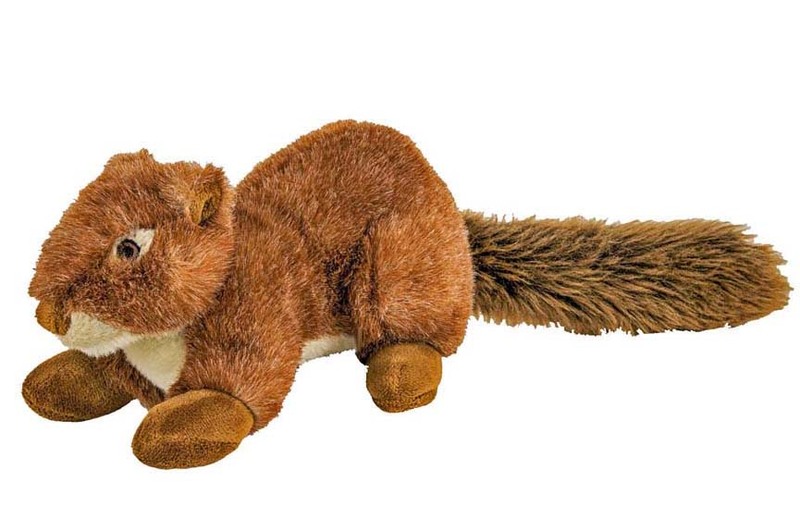 Soft, fuzzy ones with squeakers to more advanced interactive toys that work the brain and jaws of your dog. We’re always on the lookout for the best ones. We look for a cute and durability factor, as well as how fun and interactive the toy is. It’s important to realize that toys are not going to last forever, and dogs should always be supervised when playing with a toy. Who Can Resist A Floppy Teddy Bear? The dog testers at THE NEW BARKER found these floppy dog toys so irresistibly cute, they carried them everywhere, and then fell asleep with them. The toys are soft, and good for tug-of-war playing. There is a squeaker almost everywhere the toys are touched. 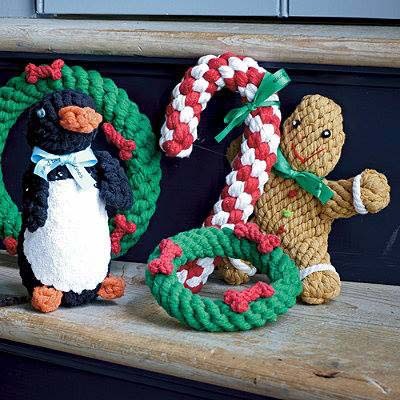 No loose pieces and the eyes are embroidered giving the toys high marks for cute, fun and durable. WHERE TO BUY: Dog Mania & Cats, Dade City (352.457.9616); Fluffy Puppies, Clearwater (727.446.7999); One Lucky Dog, St. Petersburg ( 727.527.5825); The Doggie Door, Winter Park (407.644.2969); Wet Noses, Sarasota (941.388.3647). The Thinking Dog’s Toy. 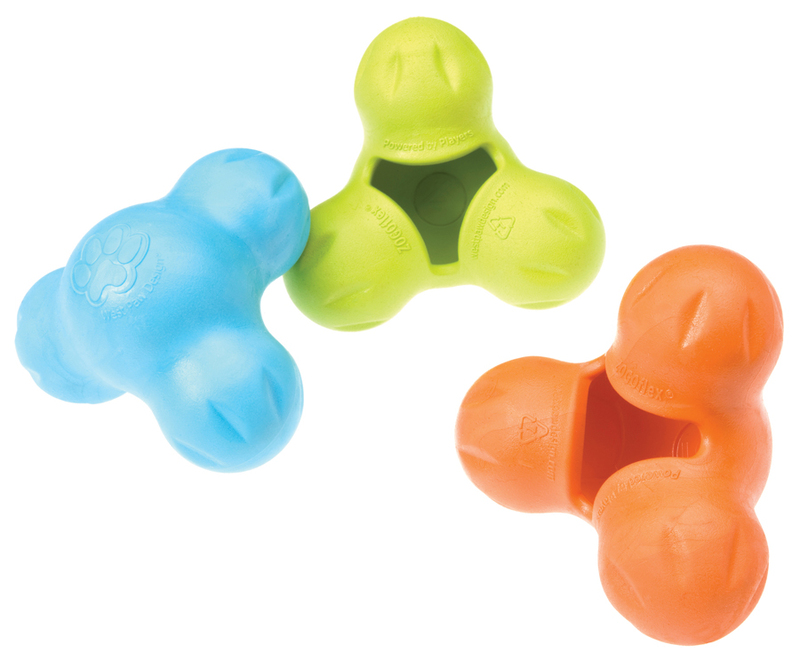 Zogoflex dog toys are made in the USA and are crazy durable. Guaranteed. Hide a treat, and keep your dog working, guessing and thinking until the treat is rendered gone. The Zogoflex is BPA-free, phthalate-free and non-toxic. Most important, Zogoflex toys are FDA compliant – important to know since toys come in such close contact with your dogs. High marks for fun, durability and interactivity. WHERE TO BUY: Animal House Pet Center, St. Petersburg (727.328.0503); Earth Pets of Gainesville (352.377.1100); Fluffy Puppies, Clearwater (727.446.7999); Groovy Cats & Dogs, Tampa (813.265.1333); One Lucky Dog, St. Petersburg (727.527.5825); Paw Paws Pet Boutique, Madeira Beach (727.329.8789); Pawsitively Posh Pooch, St. Petersburg (727.892.9303); Pet Food Warehouse, St. Petersburg (727.521.6191); Pet Supplies Plus, Clearwater (727.726.5544) & Pinellas Park (727.541.1199); Pookie’s Nutrition & Bow Wow Bakery, Winter Park (407.622.7387); The Dog House of Safety Harbor (727.726.4488). Chew On This For Awhile. 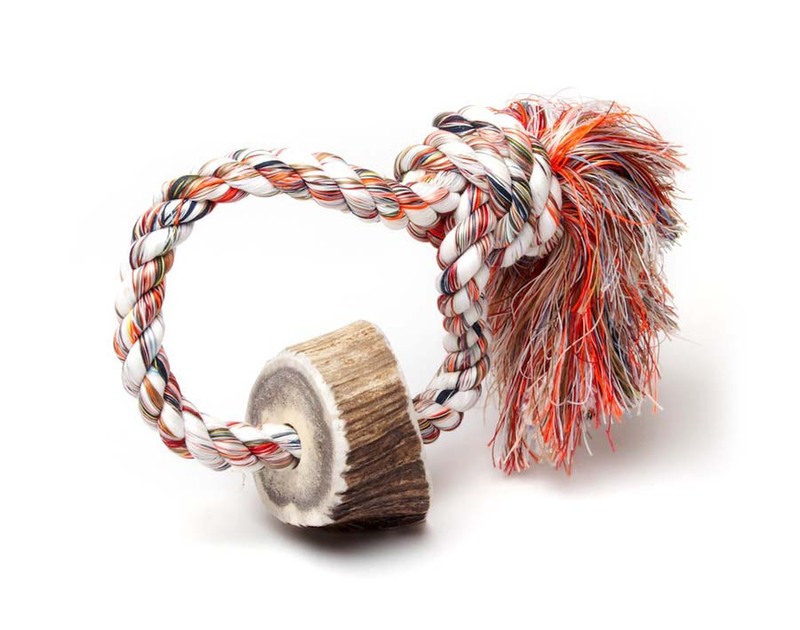 Two toys in one: a section of elk antler attached to a piece of 100% all-natural cotton rope with a knot. A renewable source, the premium grade North American antlers are naturally shed from ranch-raised elk. No animals are harmed. Once shed, the antlers are washed, air dried and sanded to remove sharp edges – no bleaching. High marks for fun, durability and interactivity.WHERE TO BUY: Earth Pets of Gainesville (352.377.1100); Groovy Cats & Dogs, Tampa (813.265.1333); Pet Food Warehouse, St.Petersburg (727.521.6191); Pet Supplies Plus, Clearwater (727.726.5544) and Pinellas Park (727.541.1199); Pookie’s Nutrition & Bow Wow Bakery, Winter Park (407.622.7387). My Prey Drive Is In Overdrive. 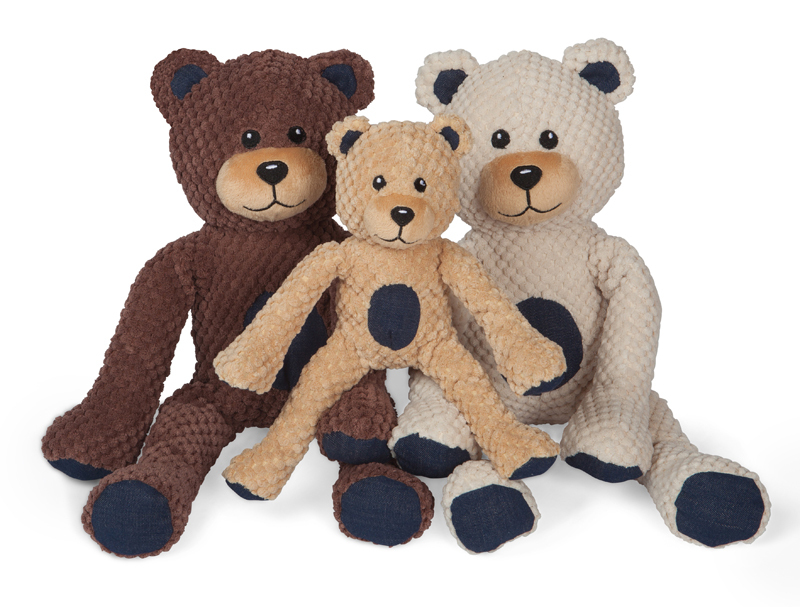 These plush toys are so durable, they almost dare your dog to bite them. Made with a superior ultra-plush outer fabric and a thick, durable TuffWebTM mesh liner. The non-toxic polyester fill is strategically placed for optimum shaping. No hard, exposed seams; embroidered eyes; no lose pieces. Machine washable. High marks for cute, fun, durable. WHERE TO BUY: Dog Mania & Cats, Dade City (352.457.9616); Fluffy Puppies, Clearwater (727.446.7999); Groovy Cats & Dogs, Tampa (813.265.1333). Good Karma Rope Toy. 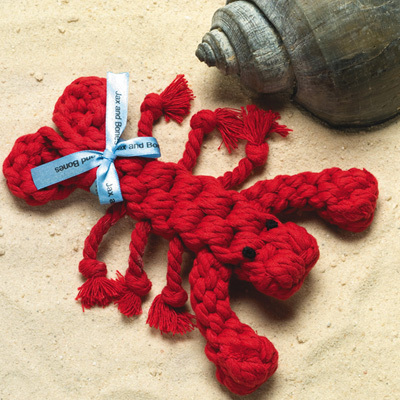 Louie the Lobster and his band of rope dog toy characters are handcrafted with attention to detail, including the use of non-toxic vegetable dyes. Feel good purchasing Louie and his friends knowing that creators Jax & Bones, donate 10% of the proceeds to rescue groups. High marks for fun, cute and durable. WHERE TO BUY: being, the art of living, St. Petersburg (727.822.6252); The Doggie Door, Winter Park (407.644.2969). BONUS TO READERS OF THE NEW BARKER: To receive a special gift, mailed to you – please email a copy of your receipt from any one of the stores listed in this post. Purchases must have been made between December 21 and December 24, 2014.